At the height of the two mile Coronado Bridge from the California mainland to the Island is a jumping spot. So many people have jumped from the 250 foot height that one of the surveillance cameras is trained right on it. Graycie is a single mom whose job it is to watch the monitors. But she gets distracted. When she looks up there’s an empty car stopped at that spot—but no person. It’s nighttime. A light is broken. The view is hazy. Graycie doesn’t see a person—just the stopped car. She needs this job. She can’t admit that she spaced out. 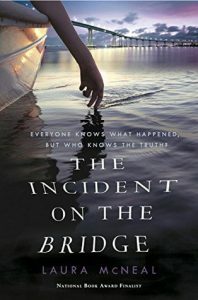 Graycie is one of at least fourteen narrators who tell the story of “The Incident on the Bridge” by Laura McNeal (Knopf 2016). But it’s seventeen-year-old Thisbe’s story. Fen drives long distance to visit his Uncle Carl on Coronado Island after his father dies. Carl, a police officer, is also brother to Fen’s father. At the highpoint of the bridge a car stops right in front of Fen and a girl gets out. She leaves the car door open. He’s annoyed. Should he help her? She waves him on. Officers Lord and Skelly assume that someone jumped. They trace the deserted car to seventeen-year-old Clay, but Clay wasn’t the driver. He’s well and alive and living on his boat, seducing girl after vulnerable girl, just like he seduced impressionable Thisbe. If someone jumped, shouldn’t there be a body? But bodies get stuck under the pylons or carried far off by currents and aren’t always found. Ted, Thisbe’s beautiful street-wise younger sister, had told Thisbe that Clay was a creep. But he was so handsome and convincing. If Thisbe had any sense, she would have fallen for tennis playing Jerome, who truly likes Thisbe. Thisbe is school-smart, but she sure isn’t people-smart. Thisbe, in desperation, had stolen or borrowed Clay’s car. She’s at the center of the incident on the bridge. Thisbe’s mother Anne is, of course, frantic when Thisbe doesn’t come home. Ted knew her sister was depressed, but she doesn’t think her sister would kill herself. She buddies up with Fen and searches for Thisbe. Frank is an older menacing character complete with an odd backstory. When he was a boy he played realistic pirating games with his sister, until it ended badly. The backstory and front story unfold in 87 brief chapters told by many voices and deserves to be read in large swaths of time rather than 20 minutes each night before bedtime. McNeal knows her setting—California’s Coronado Island and she knows California beach kids and their boating and water culture. She knows how her characters think and how they talk—most are either likeable or fascinating in some way. I felt invited into a world I knew little about. The book might start a little slowly but it picks up and begins pulling you along at a rapid pace.